A great many other substances are to be found dissolved in water. Their content is generally low and does not pose any problems, and some of them, such as micronutrients, are even very beneficial. This term covers a variety of elements including vitamins and metals, which in tiny quantities are indispensable to life. Iron, for example, plays a role in the composition of hemoglobin, the red blood cells which transport the oxygen taken in by the branchiae. It also participates in the photosynthesis of plants, which have a tendency to turn yellow if there is an iron deficiency. Manganese is equally important, as it is one of the components of chlorophyll, the green pigment in plants that allows them to absorb light and develop. There are, of course, other metals that are also naturally present in water, but their concentration hardly ever exceeds a few thousandths of a mg/liter, and some, such as copper, become toxic if it goes beyond this limit. The simplest and cheapest means of obtaining water is turning on a faucet, but there are other possibilities, especially when it comes to obtaining natural water. As long as water is drinkable, there is no reason why it is not suitable for fish. 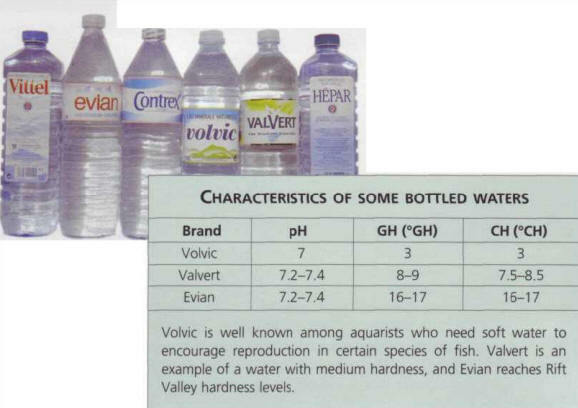 In some regions the water is sometimes too hard (general hardness above 11°GH), and so the option of mixing it with softer water must be considered. Domestic water must never be introduced in large quantities into an aquarium which already contains fish. It is also advisable to let it settle for 24 hours to eliminate any excess of gas (caused by the pressure). When filling a tank before putting it into operation, this step is not compulsory, as it will not be housing fish immediately. 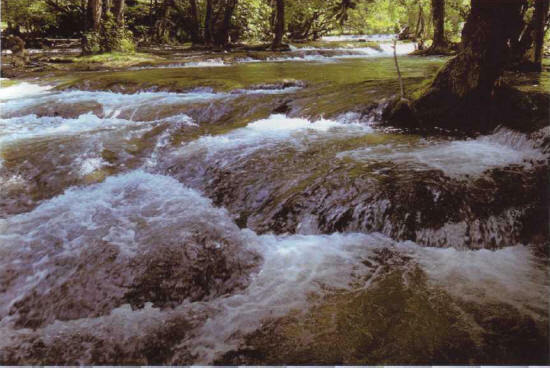 Natural water close to home usually shares many of the characteristics of domestic water, as it makes up a large part of the public water supply. However, it should be possible to find water with different characteristics not too far away. This is the most desirable water, as it is the purest, with no suspended material, little or no organic matter and a high bacteriological quality. This is of a similarly good quality, although it sometimes contains an excess of gas. It can occasionally be slightly ferruginous (containing iron), which favors the growth of plants. Movement in water, whether in a natural setting or in an aquarium, is the best means of enhancing its oxygenization. Rainwater is soft and acid, so is useful for diluting water that is too hard. It should be collected in plastic containers; if these are put under a gutter, take care not to collect the first water, as this will have cleaned the roof. In urban and industrial areas, rainwater is liable to contain pollutants, and it is therefore not advisable to use it. Such water can pose a microbiological risk, and it is not advisable to use it. Their pH is neutral or very slightly acid, with little or no hardness. Their high price means that they are only used for mixing with hard water, or for filling a small rearing aquarium. Do not forget that softened water cannot be used. This is often referred to as mineral water - erroneously so, as some brands contain hardly any minerals and are quite soft. These are certainly not used to fill up huge tanks, bottle by bottle, as this would be too expensive and time-consuming, and therefore serve a similar function to that of distilled water. 4 Some mineral water can be used in aquariums. БРОМИЗМ , проявление повышенной чувствительности к препаратам брома: кашель, насморк, конъюнктивит, бромодерма.